It is a blue pennant. In the upper hoist is a white steering wheel, in the lower hoist two white barry wavy lines. Shifted to the flyend are red capital letters "YGM". Source: I spotted this car sticker in autumn 2006 in Hamburg. Yachthafengemeinschaft Maasholm e.V. - homepage. Orange field with a blue Scandinavian cross. Malente is located on the Dieksee, in the so-called Holstein Switzerland. The burgee has a certain Nassau look. Pennant made up of a broad vertical blue stripe [on the hoist], two white, isosceles triangles placed vertically, with their bases on the blue stripe, and a red lozenge on the fly. A white wolf trap is placed vertically in the blue stripe. "The arms remained unchanged until the early 18th century, when the diamonds [i.e. Bavarian lozenges] were replaced by the so-called wolf-iron. This symbol was used as a village and city symbol on border stones, but not as arms. The arms were officially granted in 1896." A similar wolf-iron (German: Wolfsangel) can be found in the flag of Halberstadt (Saxony-Anhalt). Blue pennant with a red border and a white triangle charged with the letter "M" in red. Burghausen is located in the East of Bavaria, on the Austrian border. Quarterly divided blue-red pennant. Minden (80,000 inhabitants), renowned for its cathedral, is located on the river Weser, which is crossed there by the Mittelland Kanal. 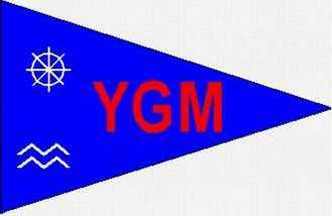 Mittelmeer Yacht-Club München (Bavaria) - White burgee with a white and blue windrose (NESW), whose eastern branch extends until the point of the burgee. Mittelmeer is the Mediterranean Sea. Blue pennant with two white triangles bordered by alternating blue and white vertical lines. The Grosser Müggelsee is a large lake formed by the river Spree in former East Berlin, near Friedrichshagen. The club is located in Hamburg-Blankenese. Its pennant is red with a black cross shifted to the hoist. The centre of the cross is superimposing a black diamond fimbriated white. Horizontally divided red-black with three white sails. Yellow pennant with a black Scandinavian cross and a blue six-pointed star, fimbriated white, placed over the cross. Black and yellow are the municipal colours of Munich. The star looks like a Magen David and I guess there is some Jewish link here. It is a yellow edged pennant, divided in the middle by a horizontal line. In the white upper half are yellow capital letters "SC" over a yellow lower case "m", all shifted to the hoist. In the blue lower half is the coat of arms of the city of Münster shifted to the hoist. It is a red pennant, divided by a yellow scandinavian cross. In the red canton is the black silhouette of the historical gothic townhall of Münster. Yellow and red have been the colours of the bishopric of Münster, which existed as a sovereign state until 1803.